This. I want this. I won’t get it but I still want it. Would be perfect by the river activities. Build it on the south side with a ped bridge to get to it. Streetcar Expansion to HSC, Capitol Hill, 23rd and Classen (at least). Would love to see a line to the airport, but that's probably too expensive. Expand the wellness center program to include all ages and mental health. I like the trees idea too. This won't increase the sales tax; however if you let it expire we will see a .01 penny drop in the tax; this is the way we have always promoted this following previous extension beyond the passage of the original MAPS projects; we are voting for an extension. Maps for Transportation: bus improvements, streetcar expansion, bike lanes and paths, sidewalks, streetscaping and fixes. Sell people on the likely more popular streets and sidewalks to get the moderately popular projects done. The key takeaway for me from his statement was the message of inclusiveness. I may be projecting, but when considering a lot of what he's said and done since taking office (lots of south side activity, the message he gave when debuting the new marathon course going south of I40, etc) it seems like there will be a push to maybe decentralize this MAPS and make sure there's a lot done on both sides of the river and east of Broadway Extension, not just in the urban core. Since I live in the Village and can't vote for or against, I'll leave all this up to the rest of you. I'd like more trees and some more pedestrian bridges for better access to parks (over the river, over highways) and wouldn't be opposed to capping 235. Expand the streetcar too. I know he’s definitely focused on the south side and mental health. The opportunity zones in the tax package are going to be big as well. Aren't MAPS taxes limited to capital improvements? Is that by virtue of the language in each MAPS program or by Sate Law? I ask because I''m seeing lots of proposals on social media for programs that would assist the homeless and other marginalized groups. Certainly these causes could benefit from some hard infrastructure, but seem to me to be dominated by operational costs. It’s just not smart to fund any kind of operational cost from a temporary tax. MAPS is a sales tax increase. This is a disengenuous statement at best and a complete falsehood at worst. but that is not what was said. It wont raise taxes, which is true. And it is not a tax increase over what we have today, which is also true. But it is a tax increase in that it increases over what was the rate prior to Maps. I don't see anything wrong with the statement to be honest. A MAPS 4 dedicated to transportation projects would virtually guarantee that the funding vote for the Regional Transit Authority fails when it comes up in a couple of years. Most people wouldn't understand that they are different and would complain that they had already voted for this. That's why I wouldn't include any heavy transportation in the upcoming MAPS4, but I'm 100% in agreement with funding for more sidewalks, streetscaping, hike/bike paths, bike lanes, etc. While I think downtown is super important to any city's health, I agree that we're reaching the end of major capital improvements that we can make downtown. That said, I'd like to see further improvement to Santa Fe Station, at the platform level, to prepare our station for the eventual Heartland Flyer extension and/or service to Tulsa. In that same vein, maybe the improvements necessary for the rail connection to Tulsa - the rehabilitation of the rail corridor between Bricktown and Deep Deuce, as well as the curved bridge to the south to connect to the platforms at the station - could be included in the station/platform improvements. 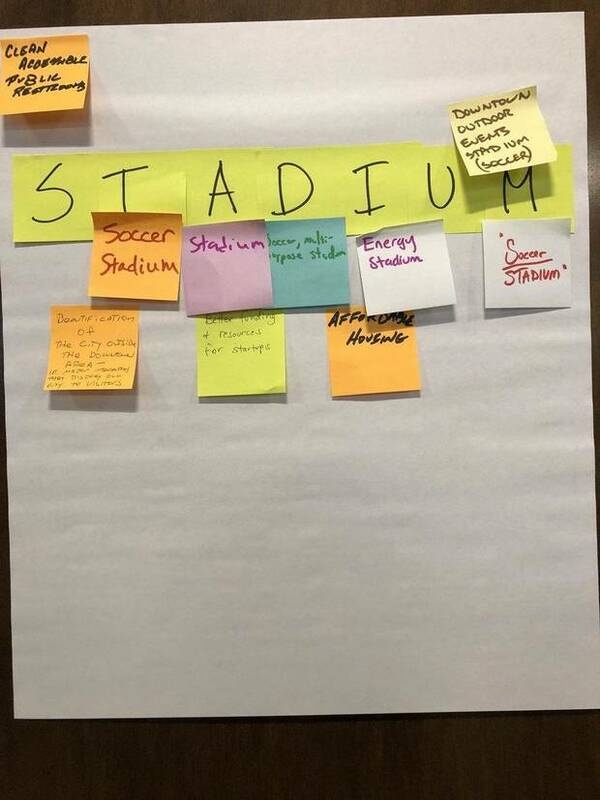 I also would love to see a multipurpose sports facility that meets (or can be easily modified to meet) minimum MLS standards, preferably somewhere near the river or near Capitol Hill. 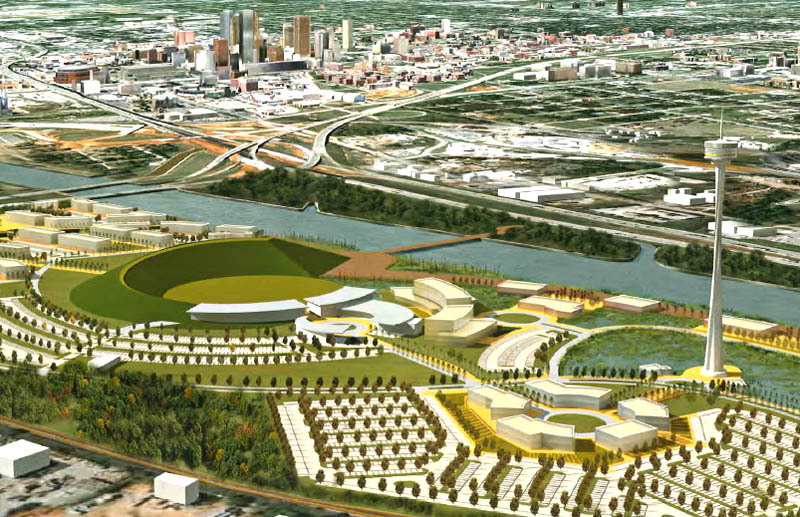 I also like the idea of further improvements at the fairgrounds, but I'd prefer something unique; things like rehabilitating or rebuilding the space needle, more public art installations (including rebuilding the arch), maybe a permanent ampitheatre... Things like that. That said, I'm also not opposed to replacing the Fairgrounds Arena - I'd just prefer to add additional amenities that would create a bigger draw to the area. In addition to the above, I agree with ChaseDweller - I'd love to see an expansion of the Health & Wellness Center program with more facilities, as well as including all ages; tie them in with some of the bigger city parks to emulate similar facilities run by park districts in the Chicagoland area. And as I said originally - sidewalks, sidewalks, sidewalks. Every major thoroughfare needs sidewalks on both sides of the street. I also don't have any specific ideas, but I would love to see both the Eastside and Southside get some MAPS4 love. A stadium is something I'd definitely not want. I just worry about longtime viability of franchises like the Energy. I just don't have a lot of faith that they'll be here. I really think we need to focus on something that ties everything together, and I think something big would be city wide beautification and proper funding to maintain it. I'm sure there are some other projects that could be done as well, but to me that's the greatest need. Any other projects should be things that we haven't done to this point, so IMO we should exclude things like streetcar expansion this go around. We don't even know if it's going to be successful. I'd rather hold that off till a possible MAPS 5. That way if it proves itself successful, no one can argue the expansion. Same type of **** like when they say "Oh no! Russell Westbrook DOES pay state taxes!" anyway, this machine of crap is too powerful to combat, let them have their fun! Complete word games and an intentional manipulation. The current $.01 sales tax is set to expire. That is why a new vote is required. In my view, there WAS a tax increase with the original MAPS...since then the original tax increase has just been extended. There is no tax increase from extending MAPS...just an extension from the original. Favor the soccer & American football stadium idea. Submitted this idea: Since USL & MLS are big risks; build the stadium with Energy FC funding 50%; that would give them skin in the game. If they want a 10,000 - 20,000 seat stadium (half chair back/bleachers) and they pay half--allow them free rent; also let them operate the stadium and give them naming rights for their investment. MLS, USL or the new pro football league AFF--it will a good promotion for OKC since CBS will cover the games. Las Vegas franchise won't last since the NFL Raiders will be rolling out in 2020. 2nd: Extend the streetcar thru film row NORTH on Classen Blvd., thru the Asian District (23rd) into the Paseo District and from downtown SOUTH down Robinson or Walker to 25th & Commerce Capitol Hill District and over to Stockyard City District. We could really promote the Stockyard City brand and build off its culture. 3rd: (My pet peeve) Build a $20 million 625 foot Space Observation Tower on the American Indian Cultural Center Museum area (operate year round) or State Fair Park. We need to build up other unique Districts within OKC. Understand you have some frustration as evident in your post. You can begin by getting involved in the process. Steve, seriously, what would you like to see--be specific. I don't get the push for a stadium. Stadiums generally have little, if any, economic benefits for local economies. Stadium is a terrible idea. The subject of 'logrolling' is going to come up again. Generally speaking, higher courts have ruled that you can't pass taxes (and yes, this is a tax) and mix a bunch of separate and distinct items together under one vote. This is why even with the G.O. Bond there were a bunch of different initiatives that had to be voted on separately. The way they got around this with MAPS 3 was to merely word the approval as 'capital improvements'. The individual projects were not listed on the ballot but they were absolutely budgeted as put forth in the marketing campaign and then a plan was excecuted around those specific budgets. So now, we come back up on this issue once more. And people should question why we can't vote on the individual projects. You might want an arena but not a soccer stadium, for example. Or you might want the streetcar expansion but not a cap for I-235. Right now, I'm sure the plan is to lump everything into one approval but don't be surprised if that approach is challenged in a court of law. That would be a solid waste of both the persons money and cost the taxpayers money. Because there is little doubt that the last maps ballot was completely legal. Ultimately we need a master plan for the streetcar that services much of the I-44/I-240/I-35 inner loop of OKC, and that complements the RTA. Right now they should have a working design of how this is all going to fit together. If we're going to have a line that goes out to the zoo, we need to know how that ties into a potential OUHSC line. Each phase of the system needs to both make sense on its own, as well as function as a part of a larger system. So let's say the next logical steps for the streetcar all branch off from the downtown line. We could go down Robinson for a Capitol Hill extension. We could go down Reno and then Exchange for a Stockyards City expansion (I'm not sure how you'd incorporate that with the mess that is the Boulevard though). You could go over to the HSC, you could go up Western to a 23rd street line, and possibly all the way up to 63rd. I think you could even go all the way down Western for a line that just services the south side. But we can't do more than one of these extensions with Maps 4. I think we pick one and go with it. My preference would be Capitol Hill, but if people are pushing for an I-235 cap, then there'll probably be pressure for it to be a HSC extension.